I'm thousands of feet in the air right now, heading back home to Houston from Charleston, West Virginia. I left my babies for longer than a night for the first time ever, and I can't wait to get back to them!!! At the same time, I'm so grateful to have had the opportunity to take this trip and attend my great grandmother's funeral, and also spend some time with my grandmother. Fair warning- this post is going to be pretty personal. My great grandmother was a really special person in my life, and I feel the need to share a little bit about her as my own personal tribute. If no one finds it interesting, that's okay. But I do think she had a pretty neat story that you might enjoy, and there are some pretty special five generation photos near the end that I think are pretty cool. My great grandma, Doris, had such an amazing life story. She was born in 1919, and met my great grandpa, Preston, on a streetcar! They secretly eloped when she was just 19 years old, and didn't even tell anyone they had married until a month later! They were so in love, and it showed, even after decades. When my great grandfather passed away in 2006, they had just celebrated 68 years of marriage, and we're still very much in love. 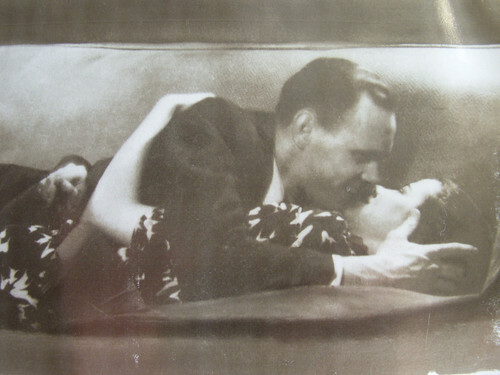 I've always treasured this picture of them from 1938- doesn't it look like it's straight out of a movie? Doris didn't have an easy life. Her mother passed away when she was a teenager, and she was left to help raise her younger siblings, who she became like a mother to. Her first daughter, my grandmother, went blind at two years old. The first doctor they took her to thought it was cancer and wanted to remove her eyes right away. Doris was smart enough to get a second opinion, and my grandmother's sight eventually recovered. She's struggled with vision issues her whole life, but that's much better than having no eyes at all! Doris' third daughter, Kathy, was a dwarf. When Kathy was born, the doctors encouraged Doris and Preston to put her in a home for children, as they were sure she wouldn't live longer than 8 years or so. The doctors didn't think it was a good idea to add the burden of a special needs child to the family. Of course, Doris wouldn't stand for that. She and Preston brought their daughter home, got her the care that she needed, and the entire family was better for it. Not only did Kathy live past childhood, but she was one of the happiest people that you could ever meet. She brought so much joy into the lives of everyone she was around. Kathy did a lot of volunteer work with the Meals on Wheels program in Charleston to bring meals to invalids, and won several awards for her charity work. She lived to be 50 years old and touched so many lives- all because her mother believed that her life was valuable and refused to give up on her. That's love! Through all her struggles, Doris clung tightly to her faith and never lost her joy. She would always give thanks and praise to the Lord for helping her through them. I have so, so many fond memories of my great grandmother. Her house was one of my favorite places in the world. From the big shower that had great acoustics for singing, to the kitchen table where so many wonderful meals were shared, to the attic apartment that had that wonderful, unique smell that I'll never forget- that house was so full of love and fun, and great grandma always did everything she could to make sure that we all felt welcome there. When I was a kid, one of my favorite things to eat was cottage cheese with peaches on top, and she always made sure she had plenty of that when she knew I was coming to visit. She'd also make sure to have a blackberry pie ready when my dad came to visit- those were his absolute favorite! Some of my favorite memories were made in that house. It was really hard to leave today, knowing that it would be the last time I'd ever be there. 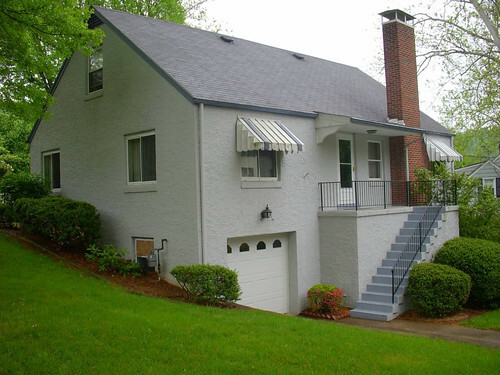 The house is too big for just one person to live in now, and my grandma plans to sell it. 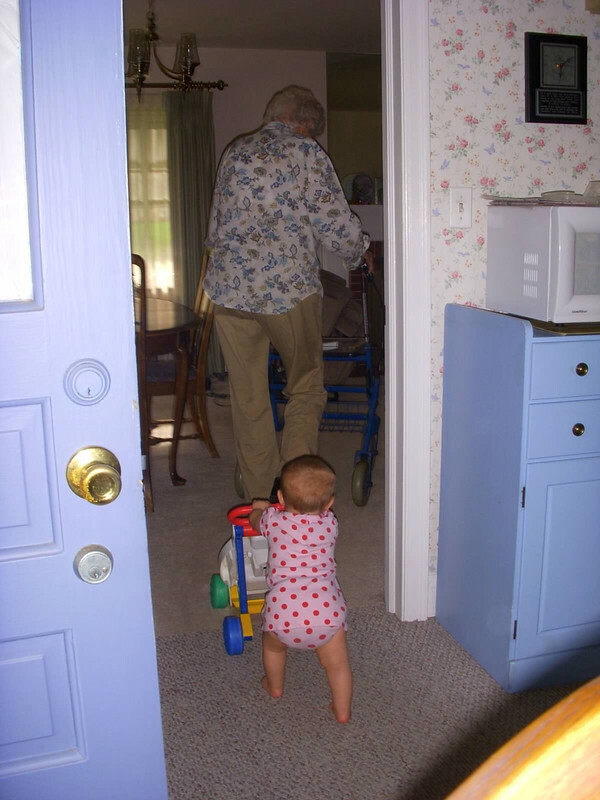 In 2009 I had the incredible experience of bringing Hayden to Charleston and introducing her to her great-great grandmother. It was so amazing to see them together. 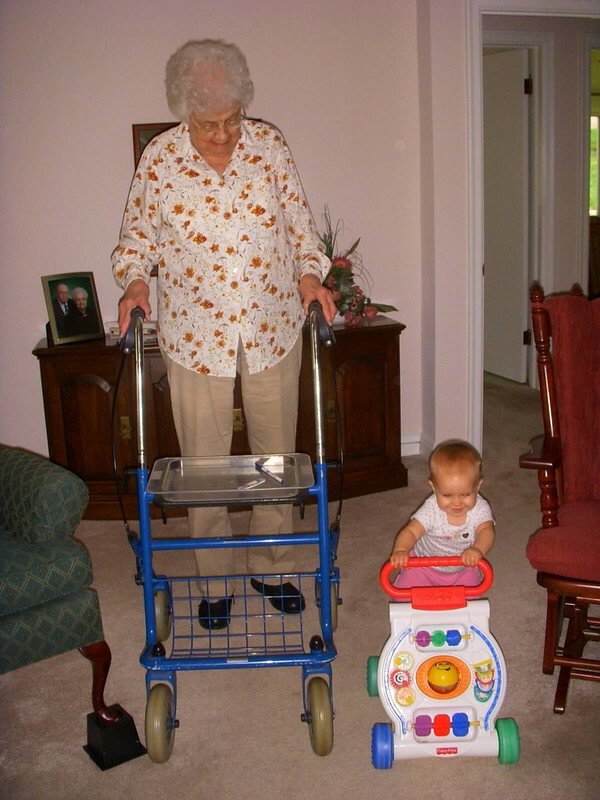 They both used walkers, and Hayden loved to follow Doris around with hers. It was so neat to see Hayden in the same house where I had made so many memories as a child. 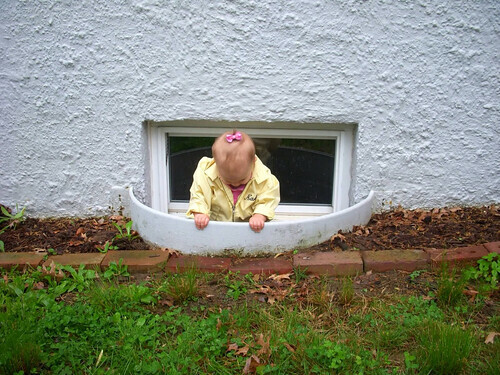 Somewhere I have a video of me playing in this same window bed where Hayden is here. My mom and grandma were both there when Hayden and I were visiting, and we had a photographer come out to the house and take some 5 generation pictures. Would you believe that each daughter here is not only the first child of each mother, but was born when the mother was 22 years old? I couldn't make this up if I tried! 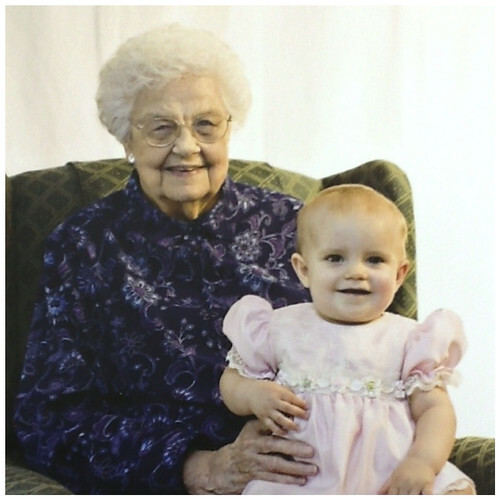 Hayden and her great-great grandmother, at 11.5 months and 90 years old. Aren't they cute together? Of course, we took lots of pictures ourselves too, even after the photographer left. 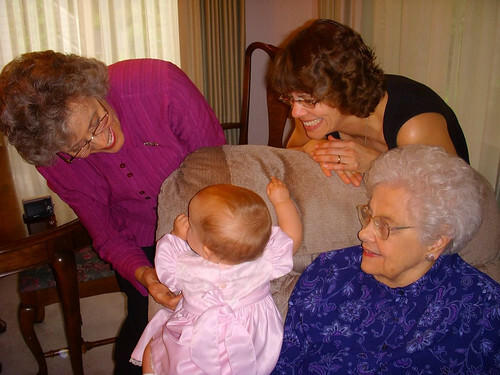 This one is one of my favorites- Hayden with her grandmother, her great grandmother, and her great-great grandmother. Can't you just tell they're all crazy about her? 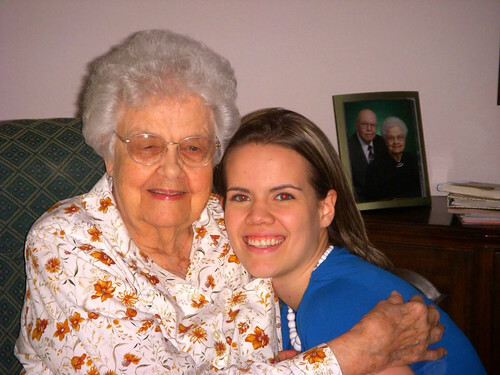 I'll miss my great grandmother so much- I already do! It's hard to believe that after so long, she's finally gone. I do love knowing that she's finally reunited with her dear husband and youngest daughter, and who knows- maybe she's already baked another blackberry pie for my dad by now. I don't know exactly how everything works in heaven, but I'm sure that they're all having a wonderful time up there. One thing I know for sure is that she's not suffering from the terrible pain she endured in the last part of her life anymore, and I know we're all thankful for that. Very sweet story! RIP, Doris! Thanks for sharing! Made me cry because that's exactly how I felt about my grandma (my mom's mom). 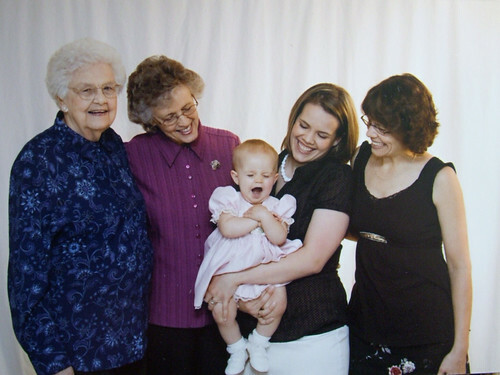 We were able to get 2 four generation photos before she passed, but I miss her so much, and it hurts my heart that my daughter will never meet such an influence in my life. I'm so so glad for all the great memories, and I know you will be as well!! !